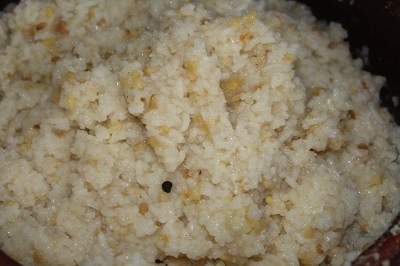 Pongal is a famous festival of South India, it is a harvest festival. Pongal in Tamil means something that is overflowing. Usually it is overflowing of rice and milk. 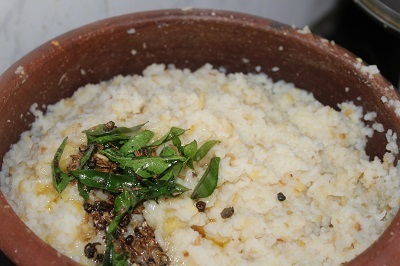 Ven pongal or khara pongal is a famous breakfast dish in Southern part of India. It is very easy to prepare, tasty and healthy. This can be served with coconut chutney or sambar. 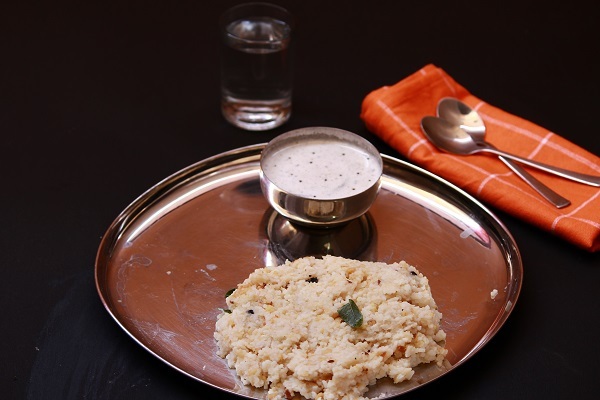 My husband loves it with onion salad, though I don’t like that combination, I love pongal with coconut chutney. While you add water, take care that it is 3/4 : 3, ie for 3/4 cup of rice and moong dal, use 3 cups of water. Here I have used 1/2 cup of rice and 1/4 cup of moong dal. Cook of 6 – 7 whistles or until rice gets cooked well and become mushy. Now to the recipe..
1. 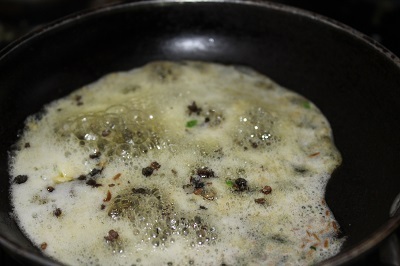 Wash moong dal in water, drain it. 2. Heat pressure cooker, add moong dal and roast it till it gets roasted well and changes color. 3. Next add washed and cleaned rice. Now add water, salt, ghee, jeeral and pepper corns. Mix well. 4. Close the lid and pressure cook for 6 whistles. 5. Wait till the pressure subsides. 6. Once the pressure subsides, open the lid, and mash the contents nicely. 7. In a pan, heat ghee + oil. Once hot, add grated ginger, cumin seeds, pepper corns and curry leaves. Saute for few seconds. 8. Add this tempered ingredients to the rice moong dal mix, combine everything well. 9. Serve it hot with chutney or sambar.